We’d love your help. Let us know what’s wrong with this preview of The Reiki Sourcebook by Bronwen (Stiene) Logan. Explaining and illustrating Reiki techniques both from Japan and the West, this guide endeavours to collate every piece of information that has been taught, discussed, argued and written about Reiki since it was developed in the early 1900s. To ask other readers questions about The Reiki Sourcebook, please sign up. Since beginning my journey into Reiki, I have come to realize that although the actual act of doing Reiki is easy (anyone can do it), that if you really want to delve into the practice you have to go searching for answers. Along the way, I have come across a number of very good resources and have developed some favorite authors, persons who I expect quality research that informs me about various Reiki subjects while also presenting their information in a way that will actually help me grow as a Since beginning my journey into Reiki, I have come to realize that although the actual act of doing Reiki is easy (anyone can do it), that if you really want to delve into the practice you have to go searching for answers. Along the way, I have come across a number of very good resources and have developed some favorite authors, persons who I expect quality research that informs me about various Reiki subjects while also presenting their information in a way that will actually help me grow as a person, as a practitioner, and as a Reiki Master. Quite a tall order, indeed. Bronwen and Frans Stiene are at the top of this list. Their work is consistently well-informed. I also find their topics quite interesting. More importantly, I find it easy to translate what I read in their books directly to my own growth and purposes. The Reiki Sourcebook is a great general resource that should be on every Reiki practitioner's bookshelf. Topics explored range from basic information and the history of Reiki through courses and an explanation of the complexity of lineages to specific Japanese and Western Reiki techniques. This is one of O Books best-selling titles, and has been in print since 2003, although it was updated in 2009. It is a great source of Reiki information, has some fabulous techniques to use on yourself or others. It is grounded in the traditional Usui, but gives space and explanation of the many branches that have developed along the way. The authors Bronwen and Frans Stiene, are very active with their teachings around the world. Their website is a lively mix of workshop information and general re This is one of O Books best-selling titles, and has been in print since 2003, although it was updated in 2009. The authors Bronwen and Frans Stiene, are very active with their teachings around the world. Their website is a lively mix of workshop information and general reiki articles, videos and blogs. Being used for my current studies in Traditional Reiki. I remember when I first started the journey of understanding - understanding of what Reiki really is. I've been trained in the art of Western Reiki. Still, while my teacher implemented some New Age techniques into his classes, he taught the real history of Reiki from a Buddhist perspective. Yet for me, it was not enough. Years later, through reading and learning, I learned about traditional techniques and greater understanding behind Reiki. And recently, I've read over "The Reiki Sourcebook" - my I remember when I first started the journey of understanding - understanding of what Reiki really is. I've been trained in the art of Western Reiki. Still, while my teacher implemented some New Age techniques into his classes, he taught the real history of Reiki from a Buddhist perspective. Yet for me, it was not enough. Years later, through reading and learning, I learned about traditional techniques and greater understanding behind Reiki. And recently, I've read over "The Reiki Sourcebook" - my only comment is that I wish I read it few years earlier. I wouldn't have to seek answers on my own, as they are all provided by the book in question. It's a very informative reference work for those who wish to learn what Reiki is beyond the hand-on-healing technique. Still, I can't rate it as 5/5, for two reasons. First, the book isn't trilling to me. Almost everything the authors included in this work was already familiar to me. This won't be an issue to completely fresh readers, of course :). Second, some content seems to be a "copy-and-paste", the phrases repeat themselves from time to time, but not too often. Still, for someone like me, it's something that should never occur in a book. This is without doubt the best Reiki book I have ever read. It is the most comprehensive guide to Reiki you will find and the beauty of it is that is covers Reiki in its pure and original form without all the add-ons of "New Age" that have accumulated since Reiki came to the West. If you are a serious student of Reiki this book is a must have. This book was recommended to me by masters of many years' experience, one who was trained in Japan as a young child. He was in his fifties when he recomme This is without doubt the best Reiki book I have ever read. It is the most comprehensive guide to Reiki you will find and the beauty of it is that is covers Reiki in its pure and original form without all the add-ons of "New Age" that have accumulated since Reiki came to the West. If you are a serious student of Reiki this book is a must have. This book was recommended to me by masters of many years' experience, one who was trained in Japan as a young child. He was in his fifties when he recommended it to me. I was a master teacher before I read this book but on reading it I revised my own practice and my own teaching yet again. Mind you I am a believer in ongoing and constant learning so that did not worry me. We are permanent students in life and most certainly we are permanent students of Reiki. 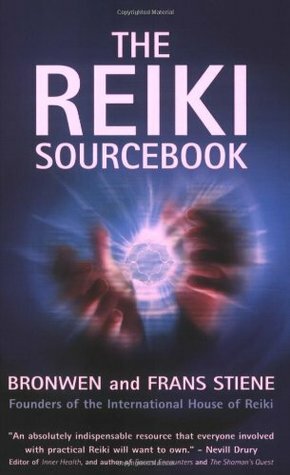 The release of the Reiki Sourcebook by Bronwen and Frans Stiene marks a pivotal point in Reiki history. Knowledge and techniques contained in the Reiki Sourcebook were previously available only to those who could afford the time and expense to travel to a weekend seminar -- and only then to become overwhelmed with information in such a short period of time. 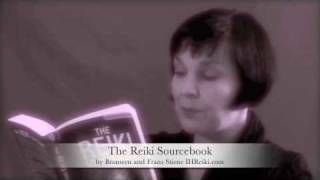 Bronwen and Frans present Reiki from the Japanese perspective, a perspective significantly different from its former presentation in the Wes The release of the Reiki Sourcebook by Bronwen and Frans Stiene marks a pivotal point in Reiki history. Knowledge and techniques contained in the Reiki Sourcebook were previously available only to those who could afford the time and expense to travel to a weekend seminar -- and only then to become overwhelmed with information in such a short period of time. Bronwen and Frans present Reiki from the Japanese perspective, a perspective significantly different from its former presentation in the West. What I respect most about Bronwen and Frans is that in this book they introduce questions for the new and experienced Reiki practitioner to explore, questions that only two decades ago were forbidden from being asked or even thought of in the community. The Reiki Sourcebook is an essential addition to each Reiki practitioners library. The knowledge it contains greatly outweighs the cost of the book, and it can be referred to again and again to find answers to new questions. This book contains everything you need to know about Reiki: The culture it came from, it's history from Usui to now, traditional and non-traditional techniques (a section I am definitely going back to), professionalism. I highly recommend it for any Reiki practitioner. A good introduction to the origin of Reiki and it spread. I liked it! It was in laymen's terms and for the Reiki Practitioner looking for a well rounded guide and history to and of Reiki. I recommend this book and own it. this is one of those books I'm reading as I know nothing about the subject. I found the information in this book to be a great addition to reiki teachings. It's a great resource to have on hand when looking to experiment with new techniques. If you're looking for a sort of encyclopedia of Reiki, this is it. It is organized very well, provides a lot of detail, and gives good, basic instruction. The best part, the authors respectfully do not share the symbols that are shared in class as part of attunements. A fascinating look into the history and varied reiki practices. I would highly recommend this book to not only those who are interested in reiki itself, but those interested in history, metaphysics and quantum mechanics. Interesting book. I learned somethings from this book not mentioned in other Reiki books. Bronwen has influenced global research into the system of Reiki since the early 2000s through her writing and research skills and co-founded The International House of Reiki and Shibumi International Reiki Association. Her down-to-earth manner and natural curiosity have enabled her to see through the numerous myths and inaccuracies that have existed in the system. This stimulated her to write a nu Bronwen has influenced global research into the system of Reiki since the early 2000s through her writing and research skills and co-founded The International House of Reiki and Shibumi International Reiki Association. Her down-to-earth manner and natural curiosity have enabled her to see through the numerous myths and inaccuracies that have existed in the system. This stimulated her to write a number of Reiki books including bestsellers such as The Reiki Sourcebook and The Japanese Art of Reiki. as well as recording two double cds for meditation with Sounds True. Bronwen is an animal lover and activist.